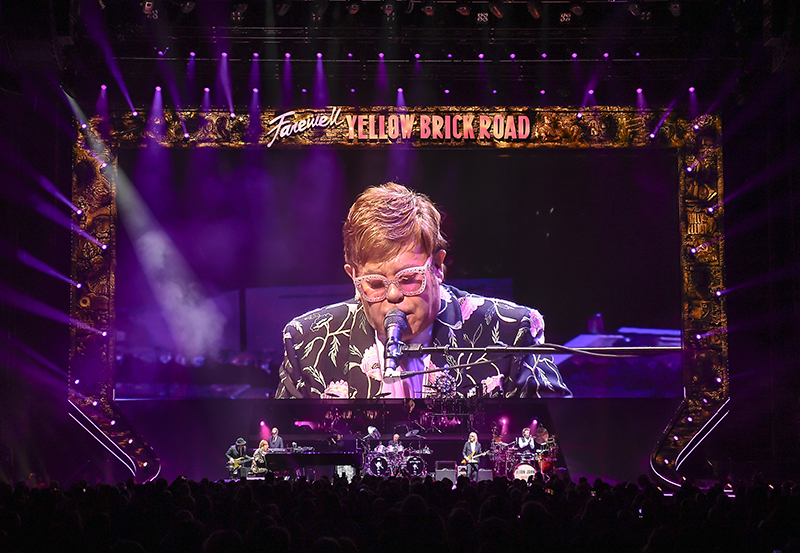 The legendary Elton John is on his “Farewell Yellow Brick Road” tour. 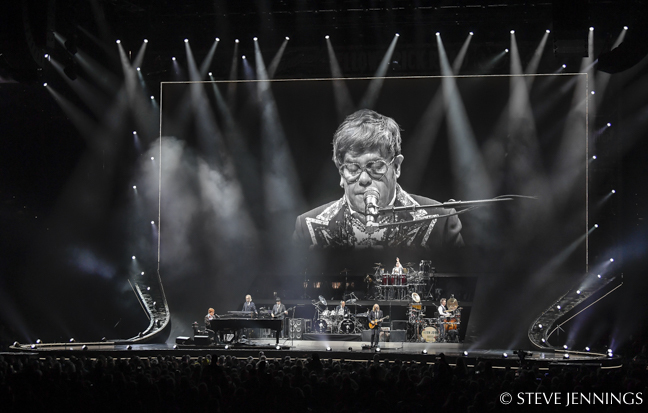 With a career spanning 50 years, his tour, which launched Sept. 8, will travel to five continents and perform more than 300 shows. 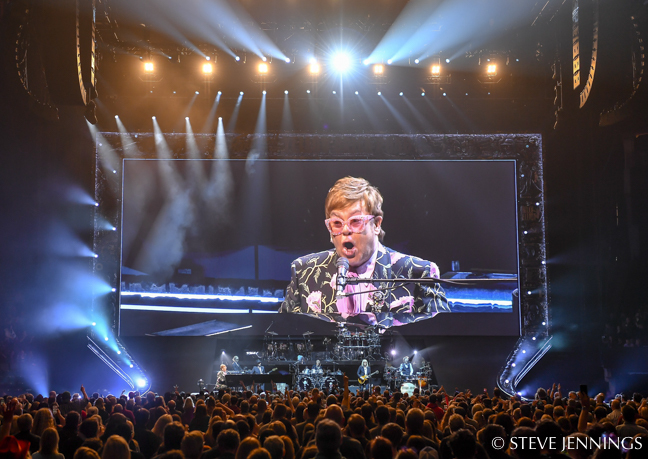 Selling more than 300 million records and numerous accolades to his credit — Grammy Awards, BRIT Awards, an Academy and Tony Award, and even a British knighthood since 1998 — few can match the talent, longevity and popularity attained by this 71-year-old artist. We spoke with key members of the creative team behind his tour, including Patrick Woodroffe (lighting designer), Kevin “Stick” Bye (lighting director), Lars Kristiansen (video programmer/technician), Ray Winkler (set designer from Stufish Entertainment Architects) and Shannon Nickerson (project manager at Tait). 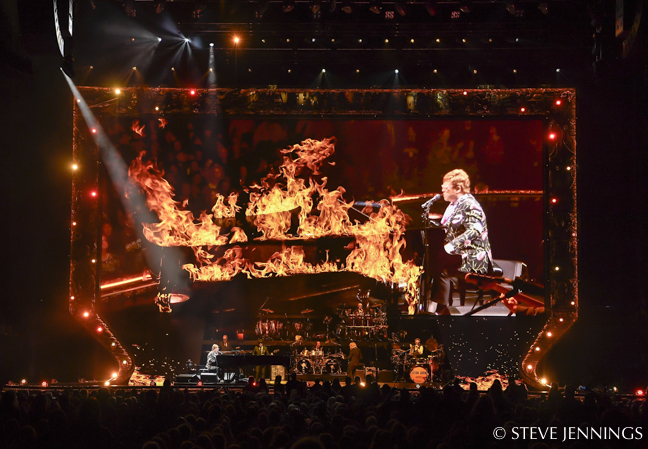 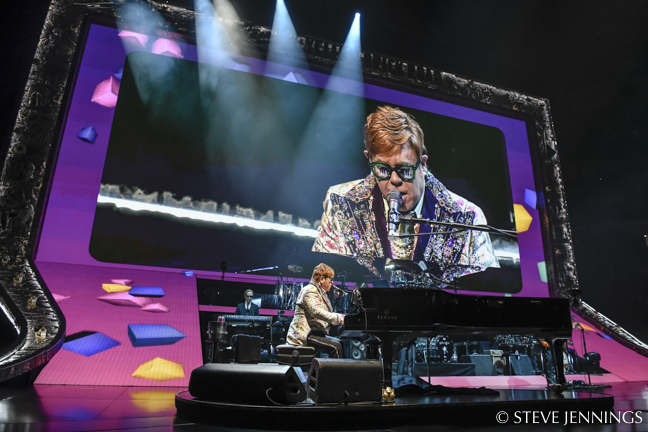 The creative team for the production consisted of Ray Winkler from Stufish, who designed the stage set, Sam Pattinson from Treatment Studio, who created the video content, and Tony King, who is Elton John’s full time creative director. 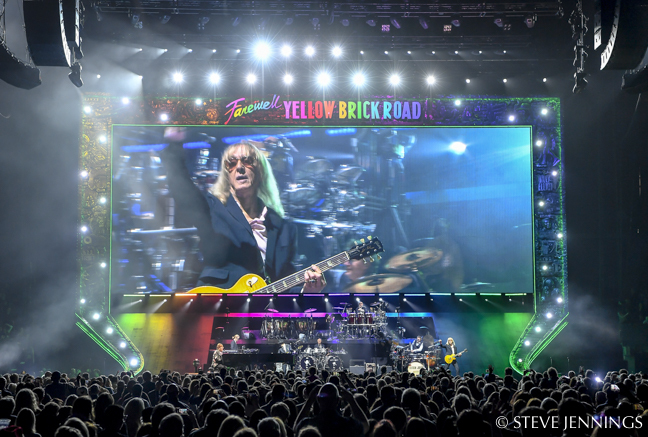 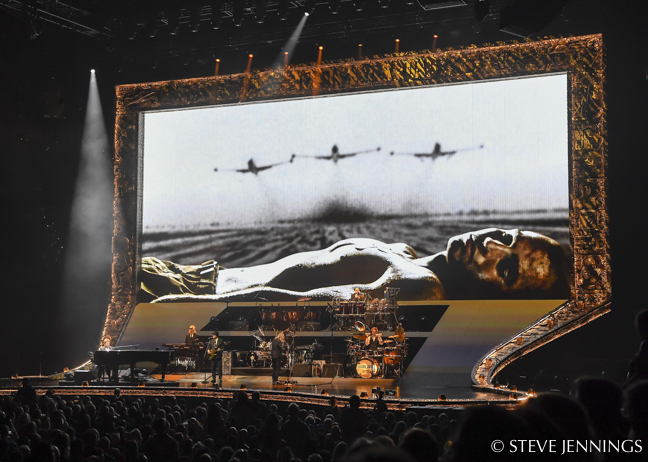 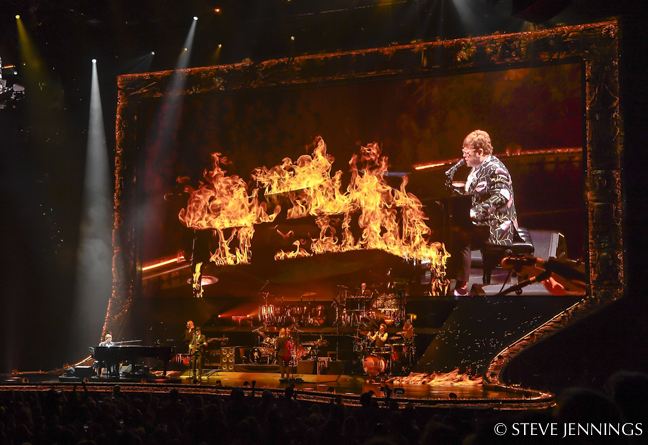 Woodroffe’s role was to light the show but also to tie together the visual elements of I-Mag, video content, lighting, scenic moves and band movement into a cohesive whole, with Elton very much at the heart of it. 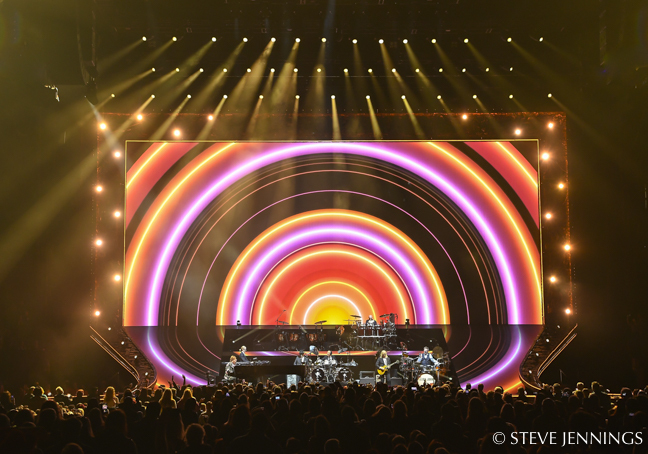 PRG is the lighting supplier for the whole tour, and Woodroffe credits their team for making the lighting production component run smoothly. 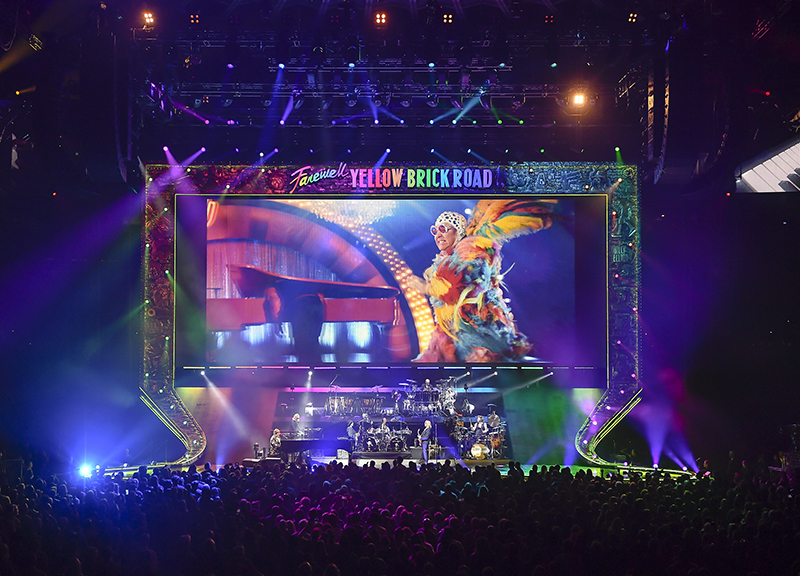 Woodroffe’s associate on the show was WBD’s Terry Cook, and he worked closely with Curry Grant and Eamonn McCullagh of PRG to work out every tiny detail ahead of rehearsals. 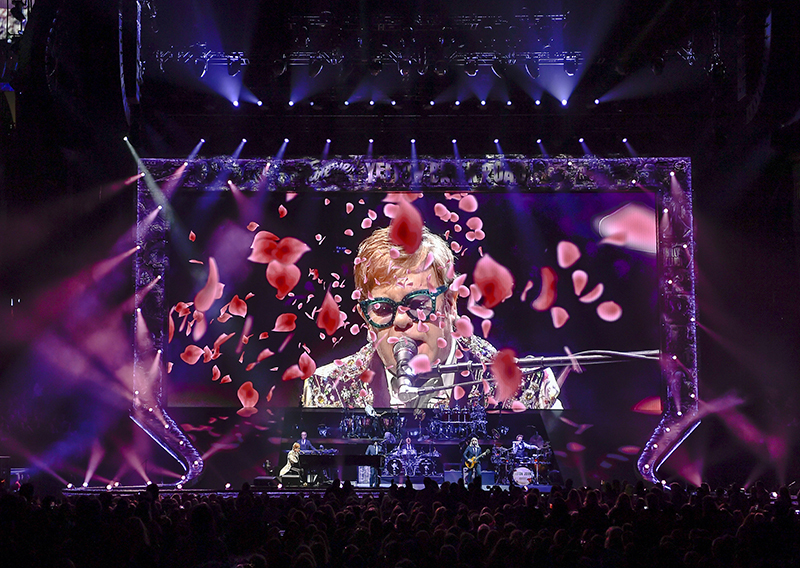 Lite guy, Bye was originally manning an Artisan console, then a Virtuoso, moved on to a grandMA1 and currently runs the show on a grandMA2. 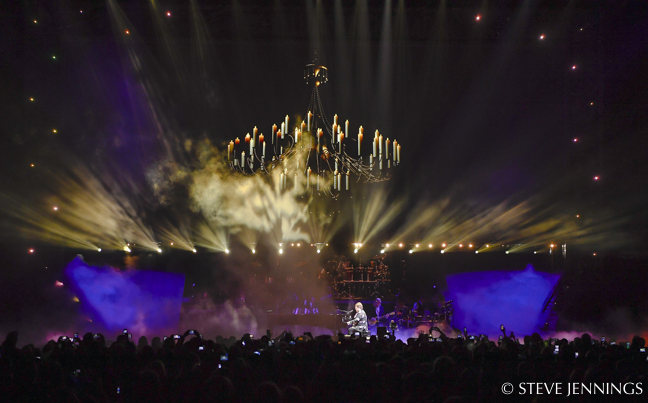 “Of course, when I first started, I was dealing only with the lighting of the show. 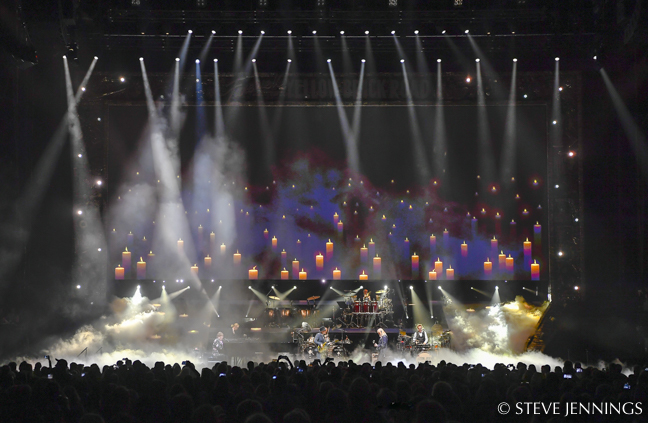 Now, as with the rest of the industry, I’m looking after the cueing of lighting and video aspects. 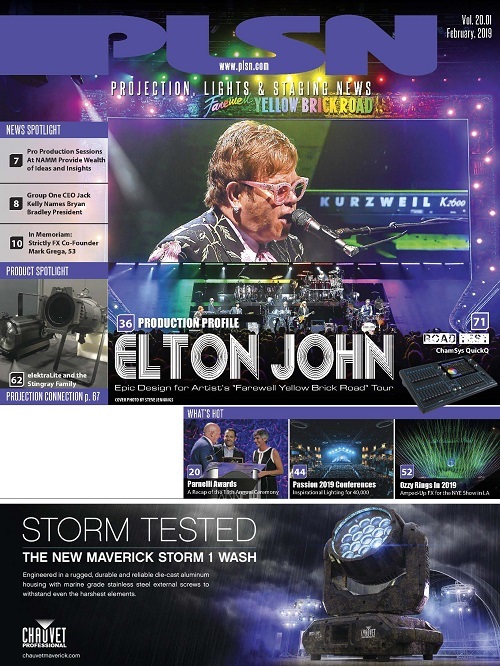 Keeping up with emerging technology is a never-ending learning process. 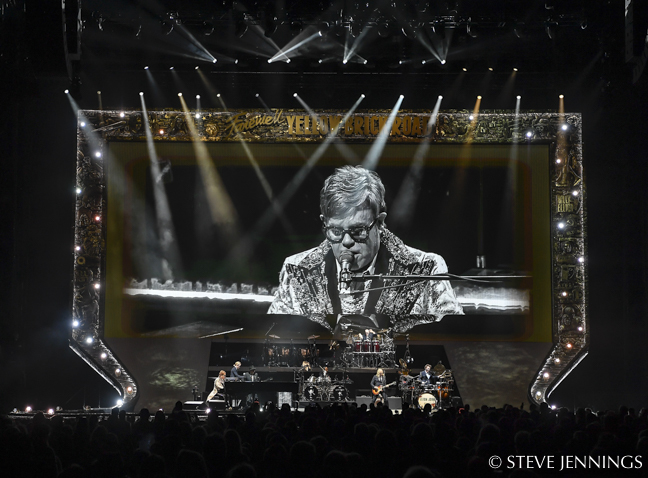 The tour rehearsed at Rock Lititz in August before moving to Allentown, PA for the first show in September. 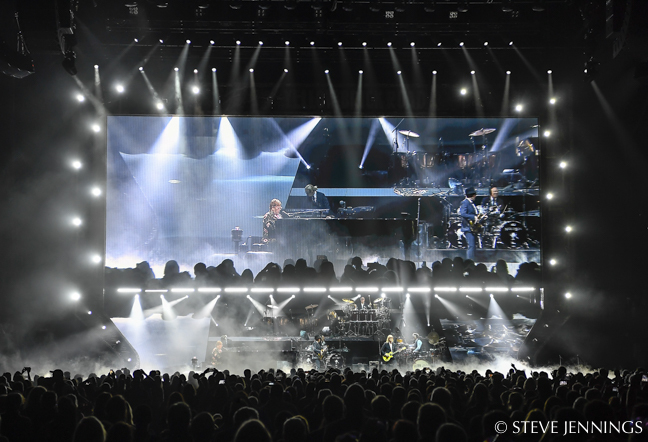 The crew moved rehearsals and programming there, with the first public show a week later. 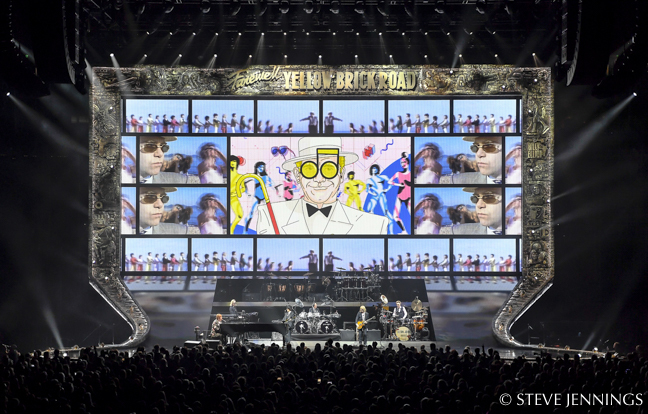 All lighting and video content is programmed into the board as well as song-specific camera inputs, notes Bye. 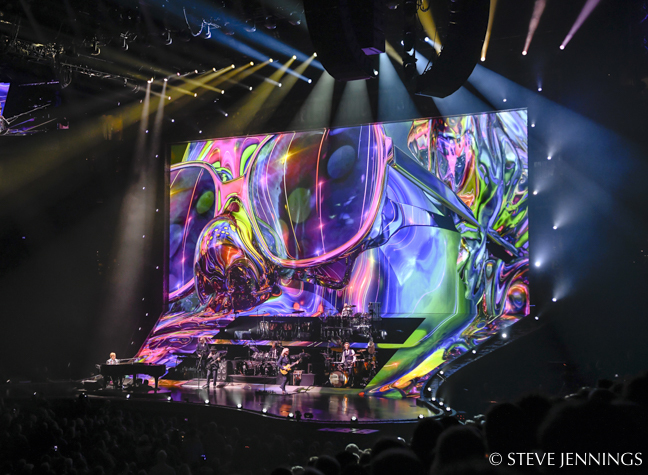 “There are also song-specific accents and color bumps that I run manually. 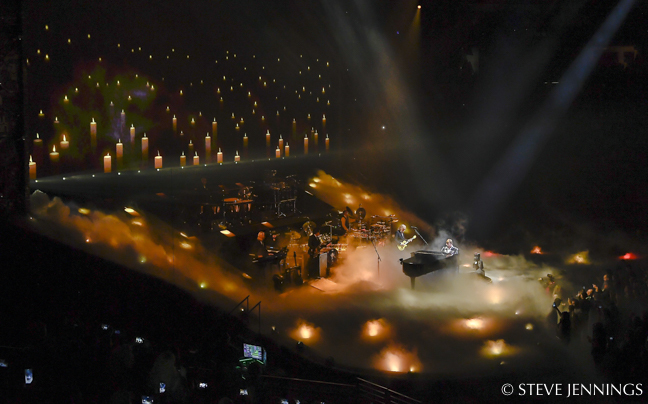 Additionally, I’ll call the spot cues. 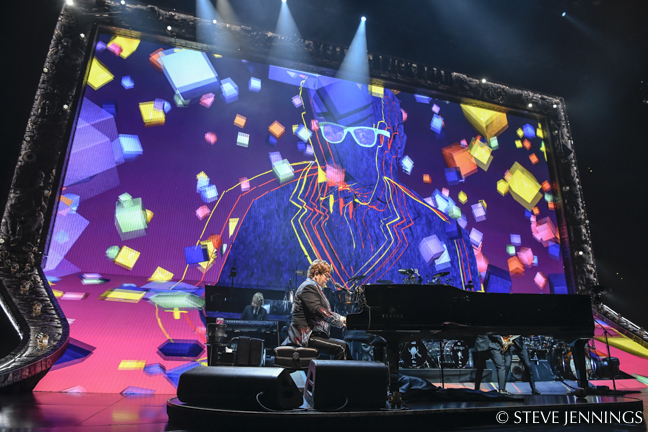 Even though the spots are automated, only color is controlled by the console. 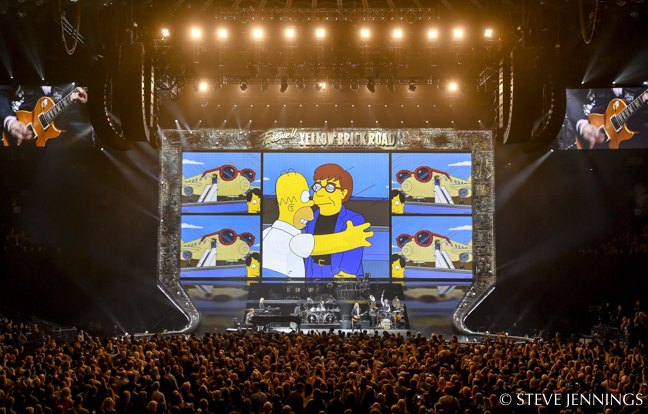 That way, there is a continuity in the way I call the show. 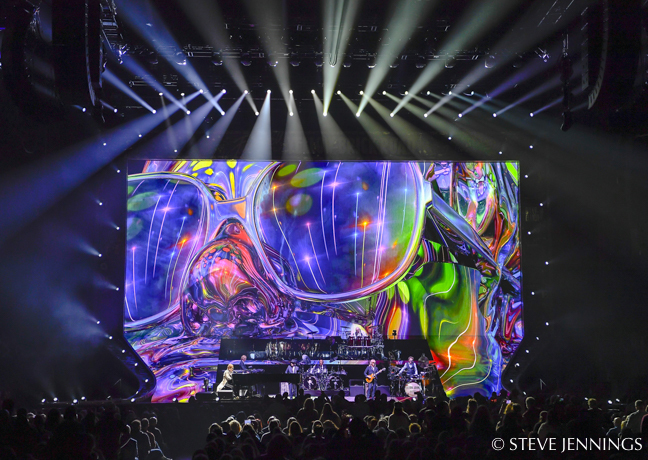 If I get into a show situation like a festival, my show calling doesn’t get rusty! The lighting and video content in the show is tightly programmed and very well-thought-out. 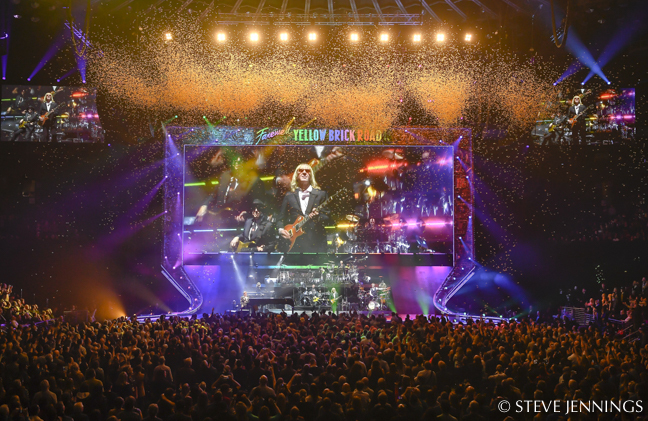 That being said, there is no timecode or click tracks, it is a totally live show. 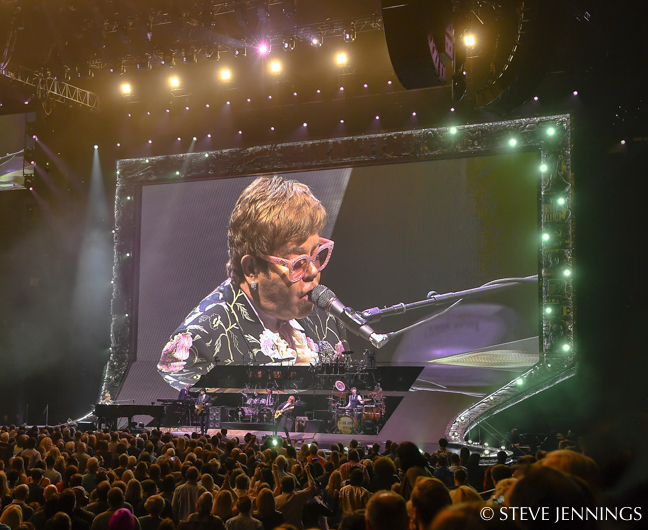 I have inhibitive fader control for every type of light fixture as well as the video elements, which allows me to manipulate certain levels in case Elton and the band are playing faster (or slower) than normal. 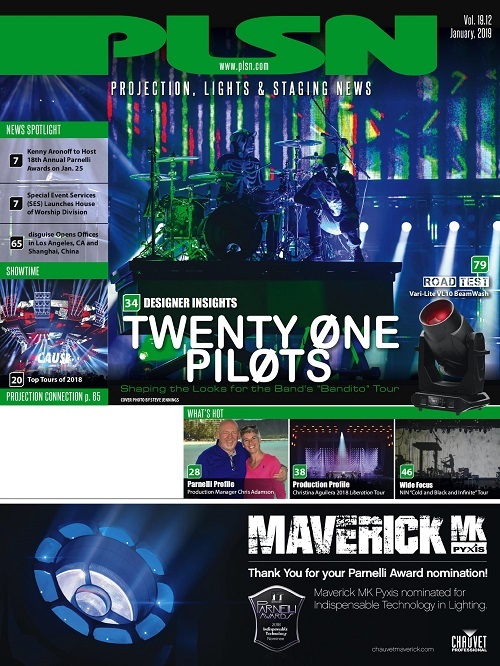 “We have John Steer, who has been directing the I-Mag video for a number of years,” Bye adds. 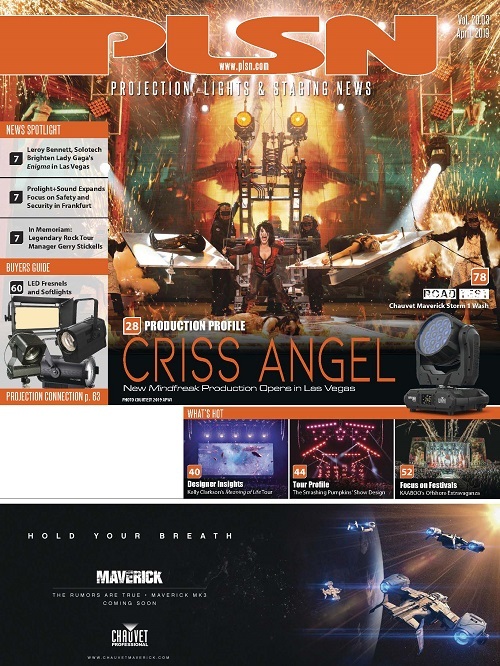 “He is an expert at sending what we need to the main video element per the creative team’s brief. 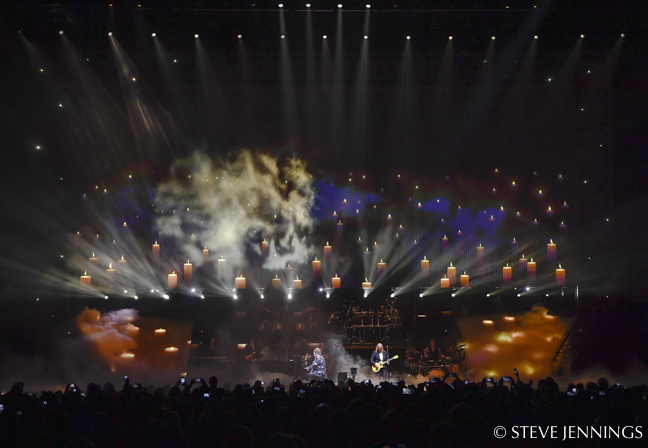 Our lighting crew chief, Corey Tom, is in high demand so we are very fortunate to have him back for this tour. 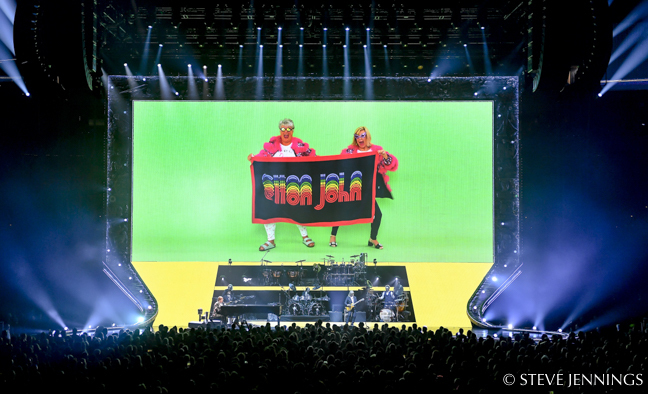 Lars [Kristiansen] has put up with me for over 15 years, and he is definitely an integral part of this tour! 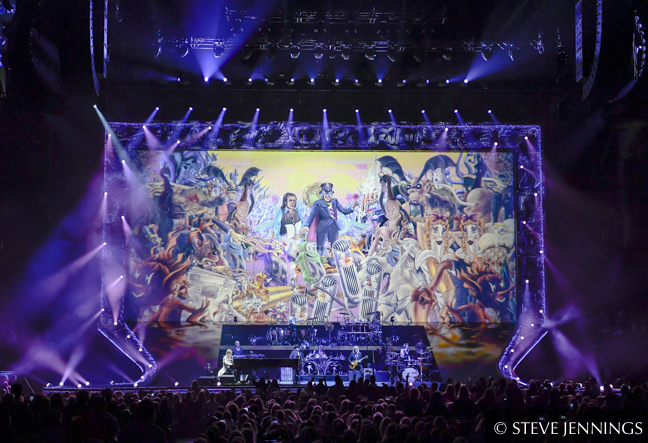 Finally, the Scenius Unicos are the bones of the show, and I’m partial to having a spot fixture-heavy design. 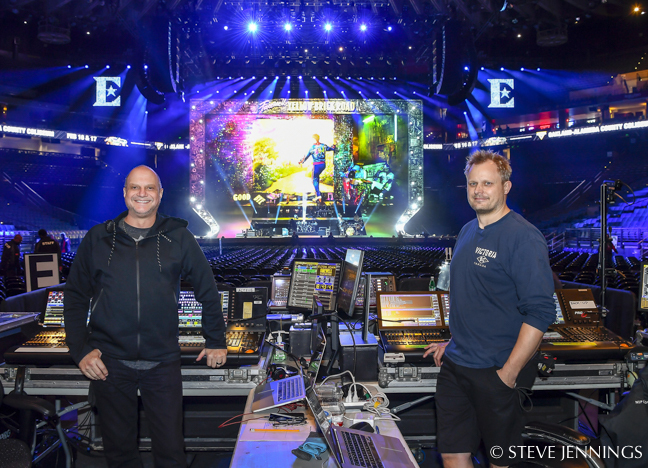 Lars Kristiansen’s role on this show is as video programmer and technician, assisting Kevin “Stick” Bye with the lighting on the daily load ins and outs. 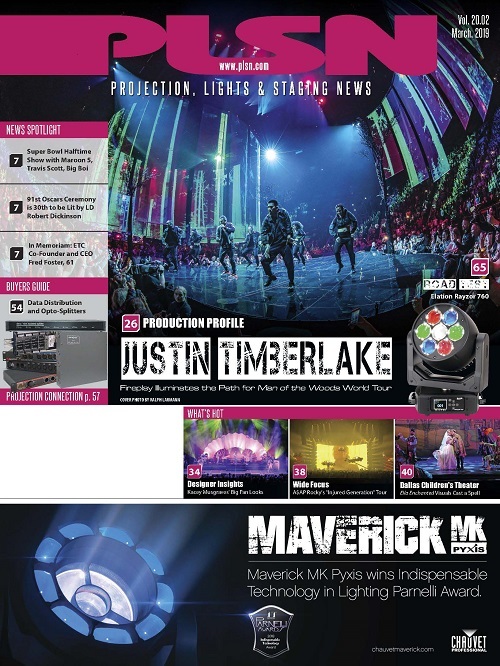 “I also look after the content and make sure everything is triggered video wise. 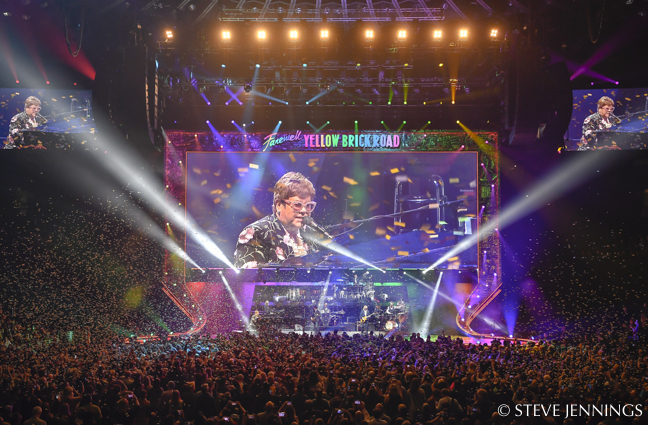 All the media is triggered from Stick’s grandMA2 console, and I keep an eye on the network and help reset fixtures, should it be needed during the show. 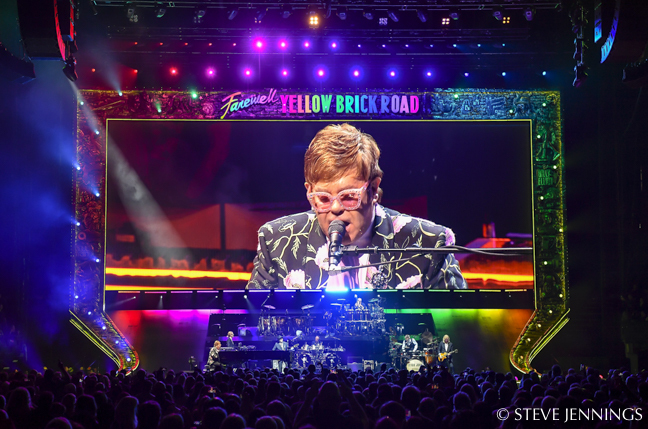 Along with communication with Stick during the show, I am also on headset with our video director John Steer and the video team back stage (Nick Roucco and James Gardener), to help with levels and inform if any issues arise. 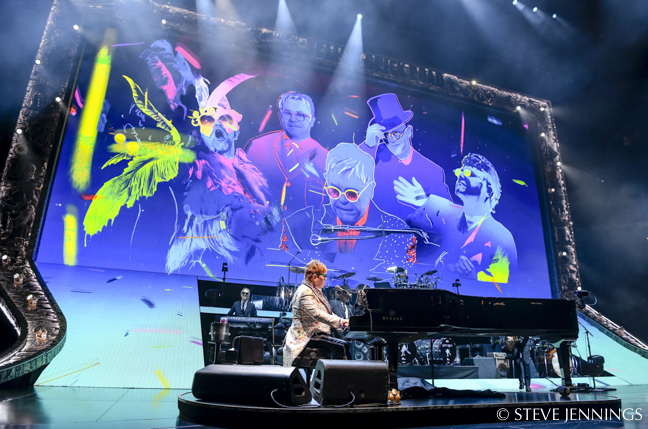 Ray Winkler of Stufish Entertainment Architects says the studio has been very fortunate to have worked with Sir Elton for over 25 years. So when Keith Bradley approached them in early 2015 to be part of the creative team, they were very excited and privileged to be invited back. 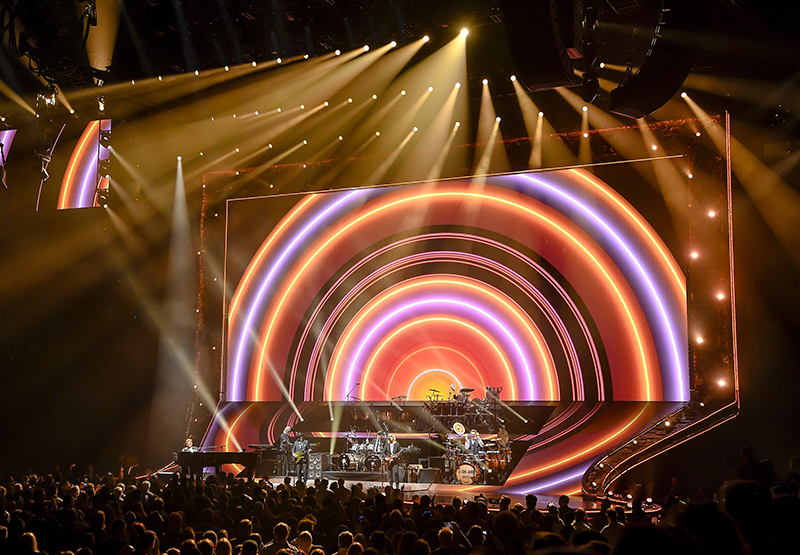 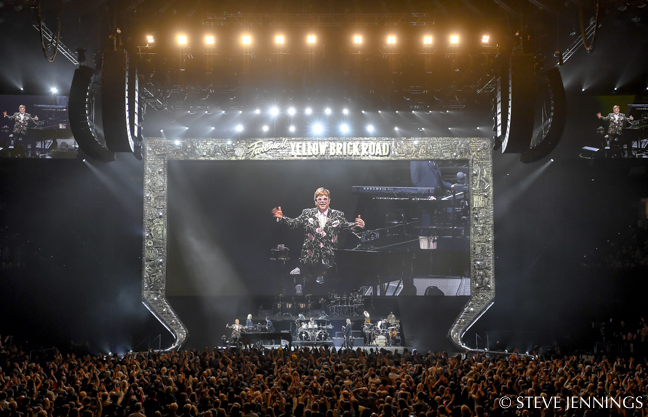 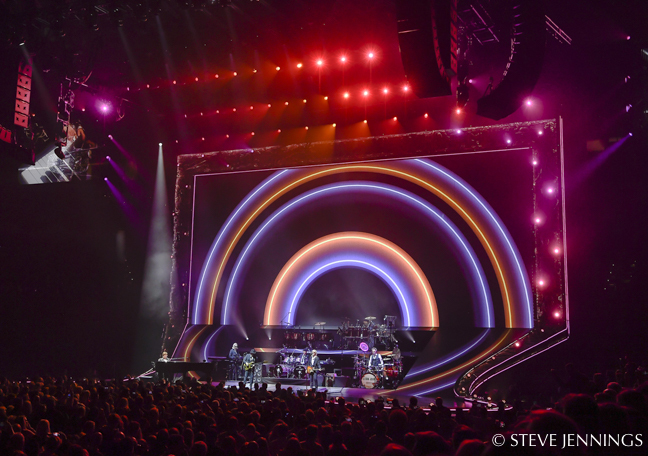 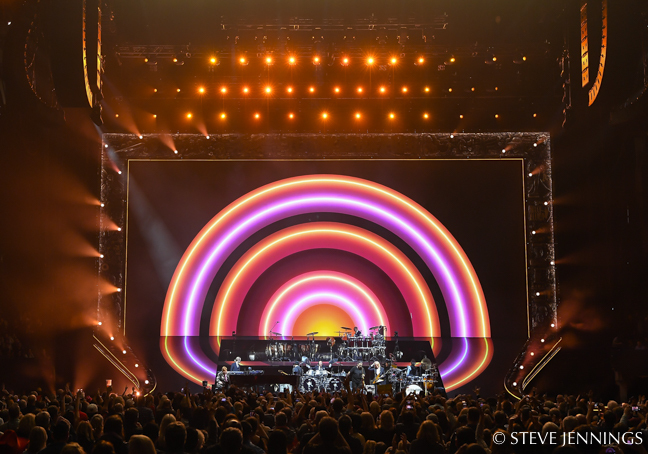 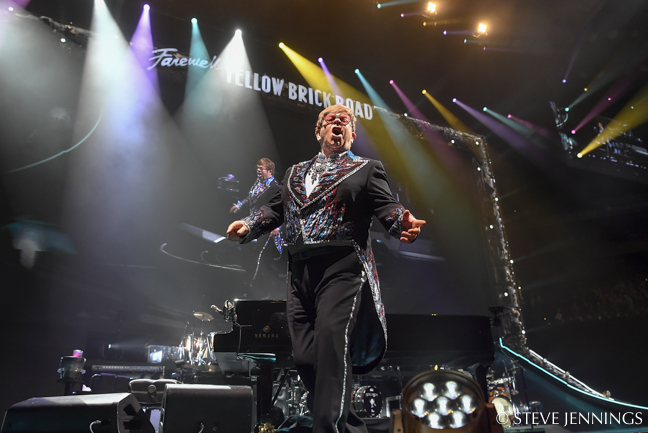 “As his Farewell tour, this needed to be a very special show, celebrating Elton’s long and colorful career,” Winkler says. 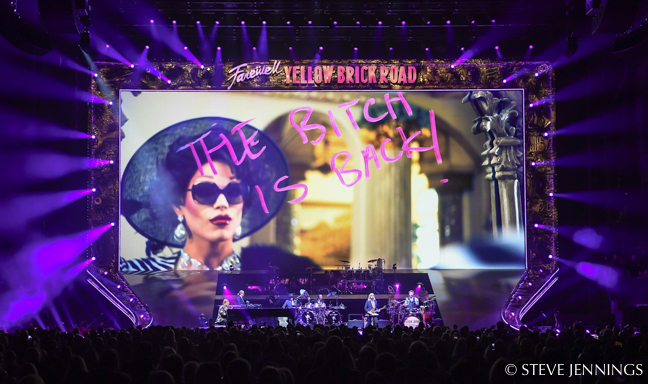 “Creative directors David Furnish and Tony King were focused on bringing together the best creative team for this show. 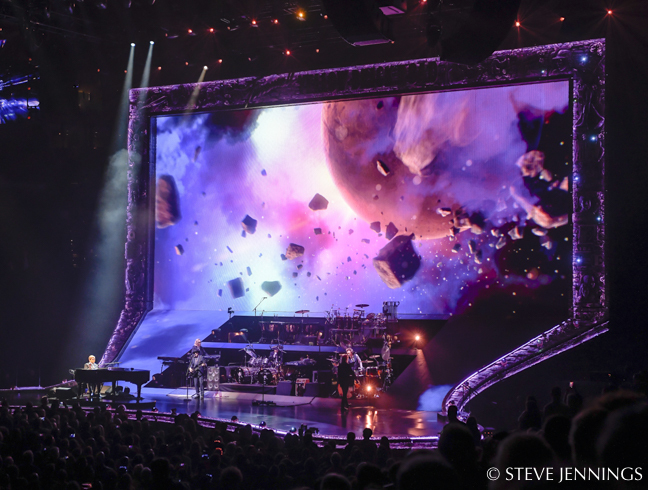 When we first met, the direction for the stage architecture of this show was wide open. 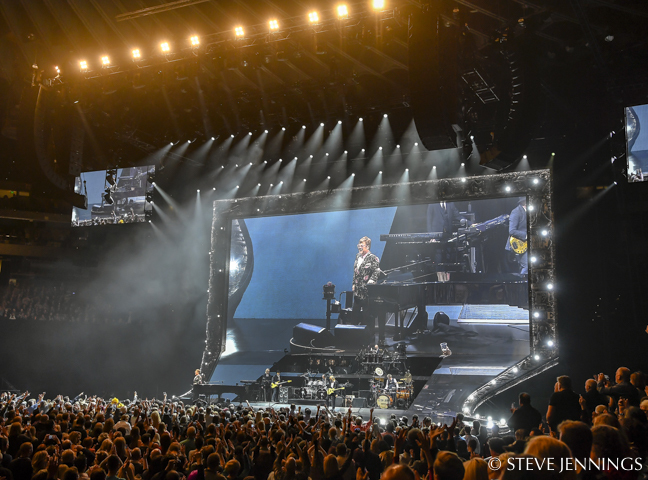 We knew that it was an arena show and therefore had to respect certain parameters, but other than that, we were free to explore. 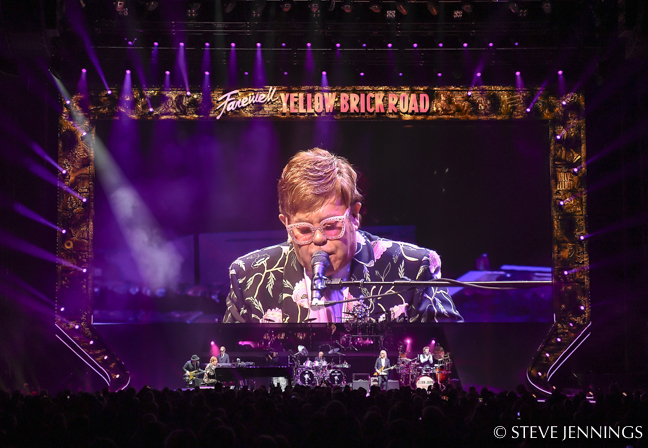 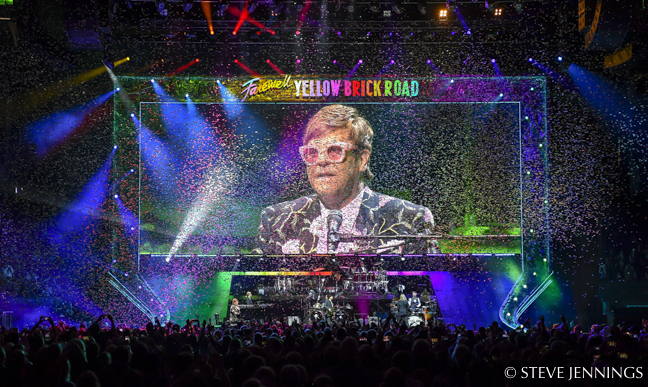 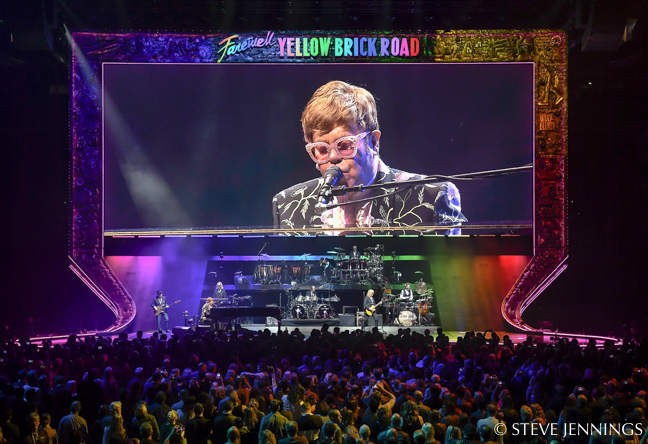 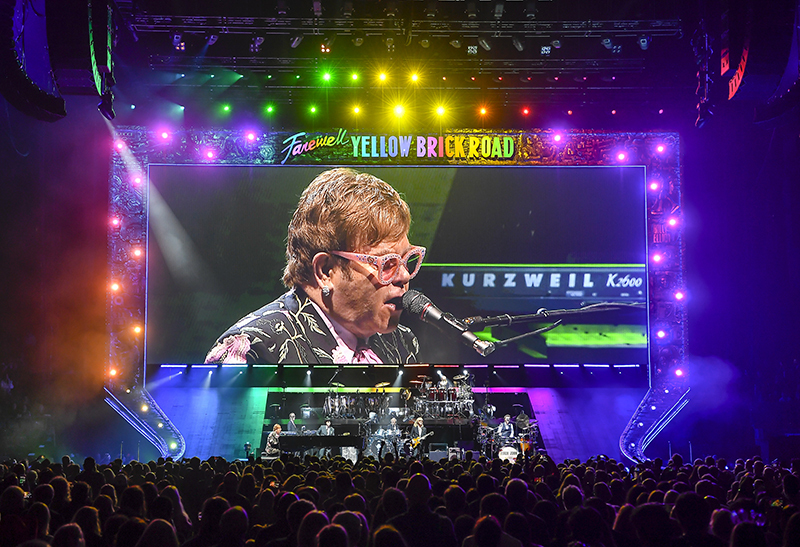 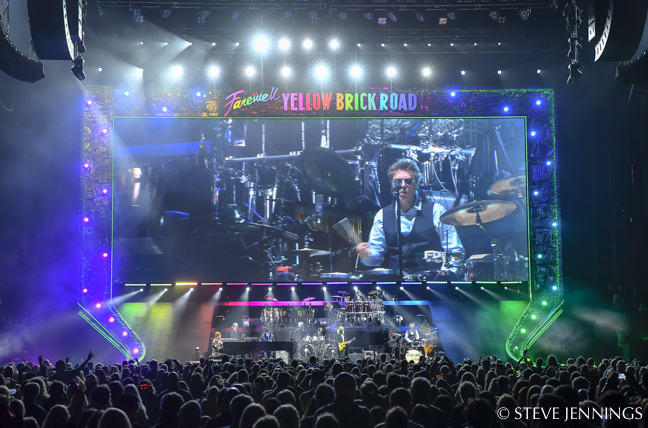 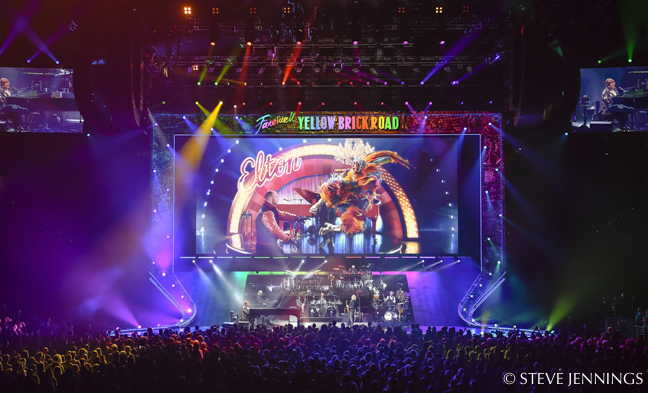 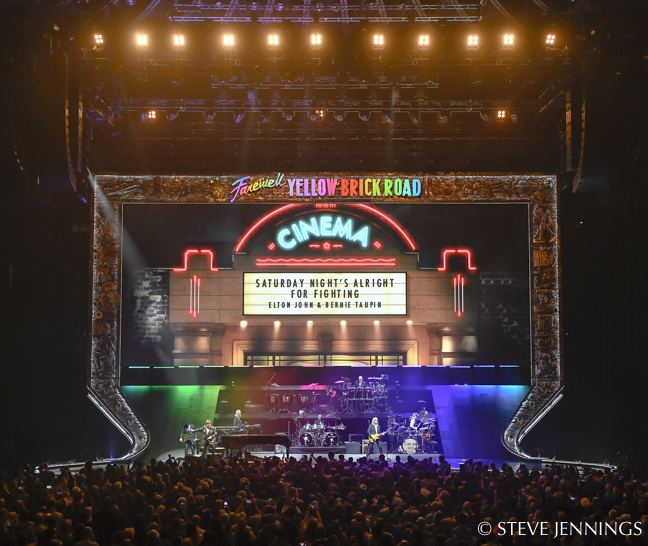 The stage was designed to frame Elton’s performance with the symbolic Yellow Brick Road so that the extensive use of video screens would find a common thread that wove the show and set narrative into a single entity. 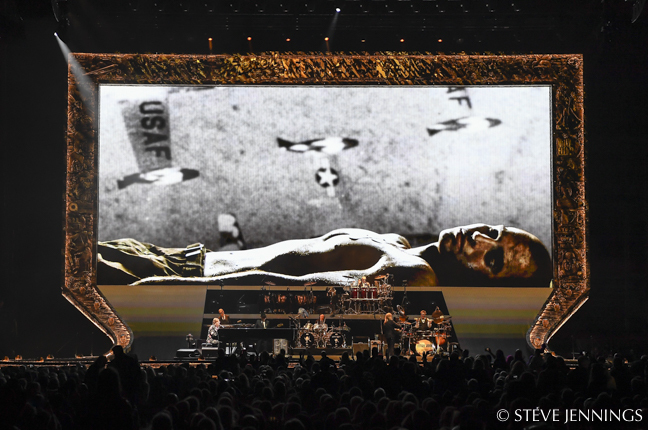 “The richly sculpted and gilded portal stood in stark contrast to the flat and clean surfaces of the video screen and allowed for a certain creative tension between the physical and digital world,” Winkler notes. 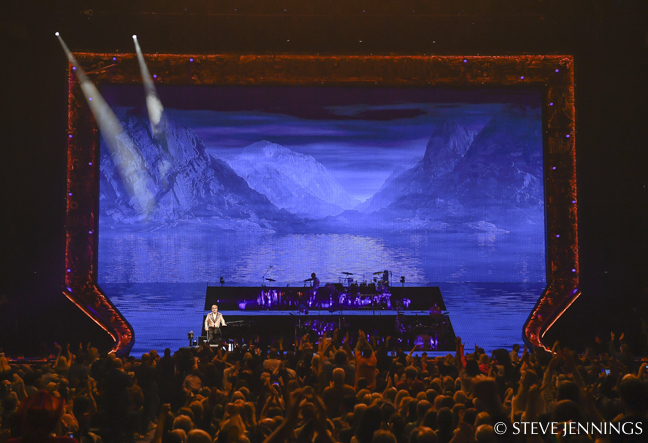 Jacqueline Pyle did the scenic sculpture for the tour. 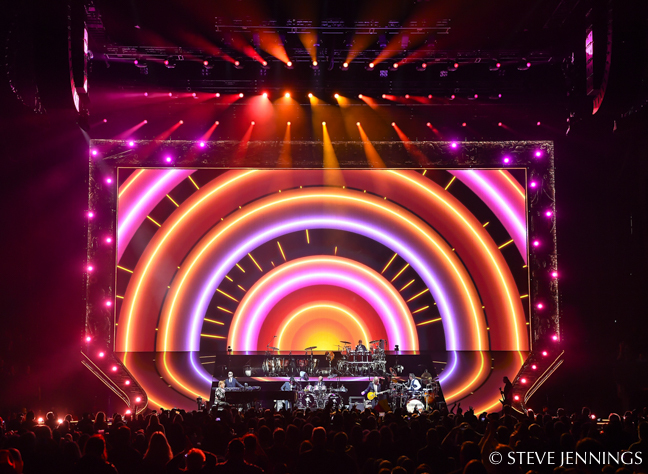 Winkler says he’s worked with Pyle for many years, and her work has been featured in numerous Stufish designs. 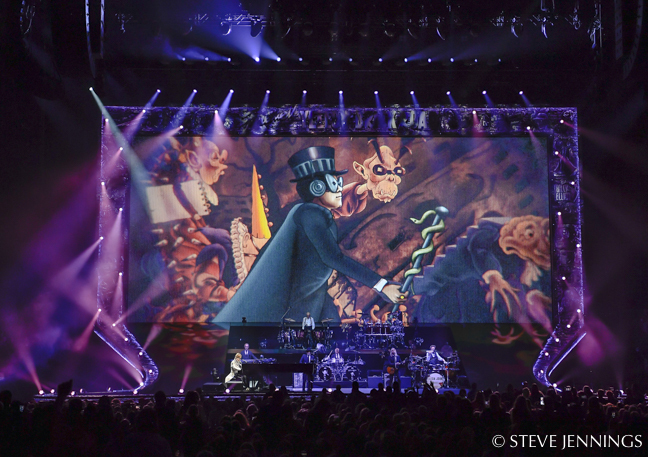 “Jacqui’s eye for detail is superb, and her ability to translate concept sketches into 3D reality is second to none. 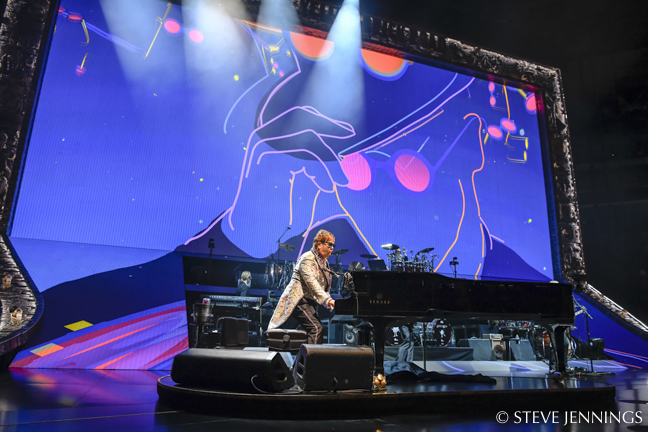 She worked with us on Elton’s The Million Dollar Piano residency in Las Vegas and was very familiar with the tastes and styles of Elton’s shows, so it was a perfect match to join us on this project. 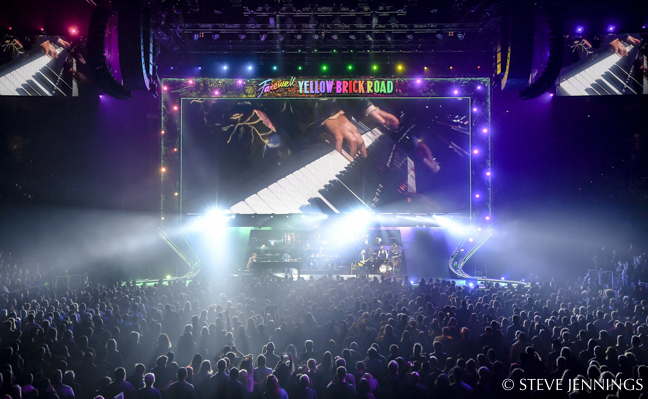 Once the basic concept of a Yellow Brick Portal was established, and the scale and proportions agreed, Jacqui set out to work on the basic layout. 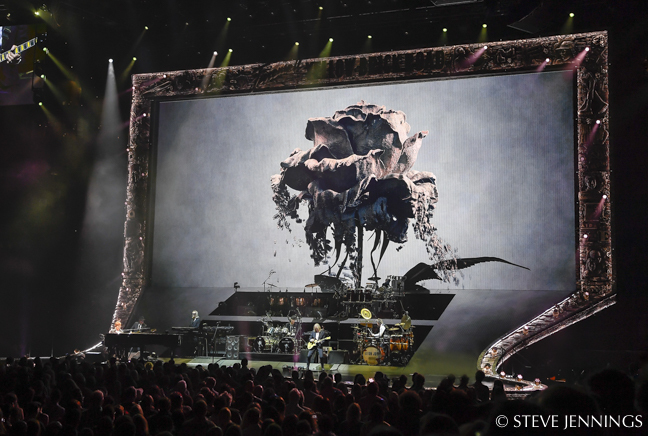 Elton and David then handpicked over a dozen of their favorite moments and artifacts for Jacqui to sculpt and integrate into the portal composition. 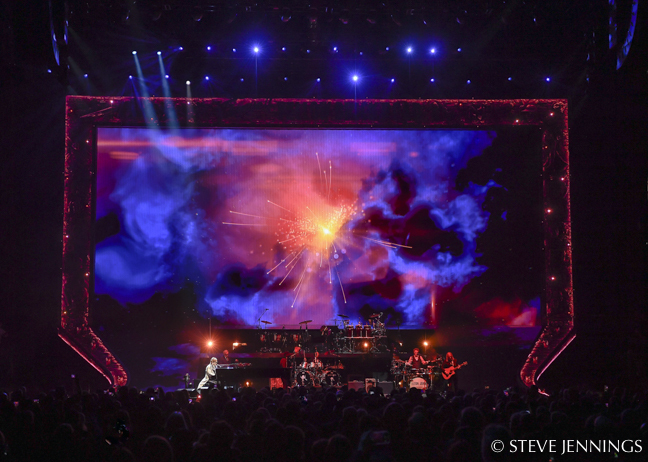 “To make the portal really come alive, we integrated lights into the set while working closely with Patrick Woodroffe and Terry Cook,” Winkler adds. 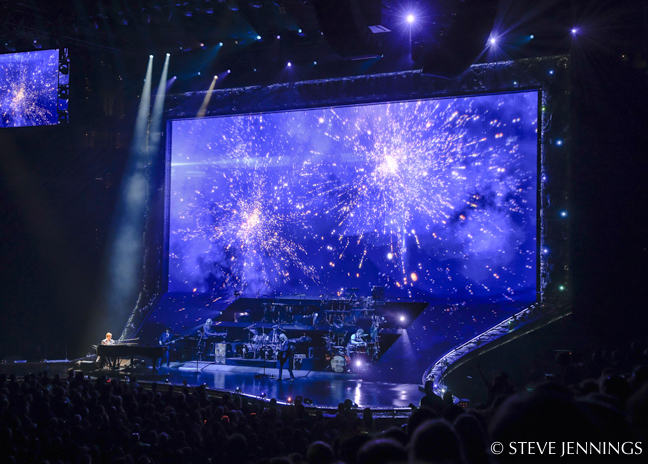 “We carefully placed moving lights and LED strips so that they became an integral part of the design & composition. The set is beautifully fabricated and engineered by Tait so that it can be assembled and taken down safely and quickly every night. 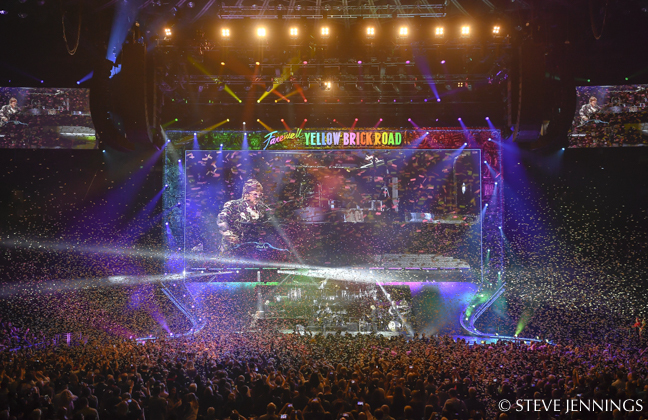 Over the course of the three years Stufish worked on this show, there were many challenges and obstacles to overcome. 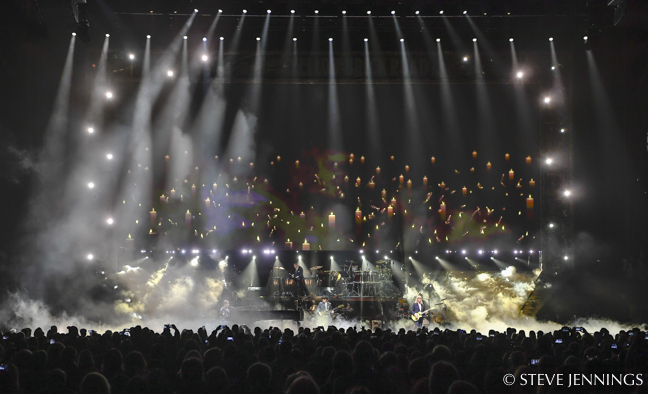 Ideas were proposed then dropped again, and the stage architecture went through numerous permutations. Tait was brought into the process a year before the first show, notes Shannon Nickerson, project manager at Tait. 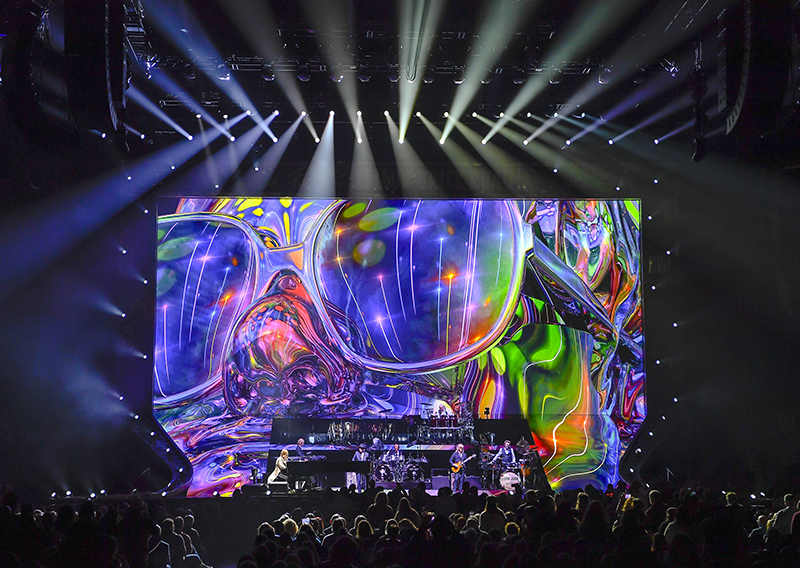 The final design developed into the grand piece of art through many conversations. 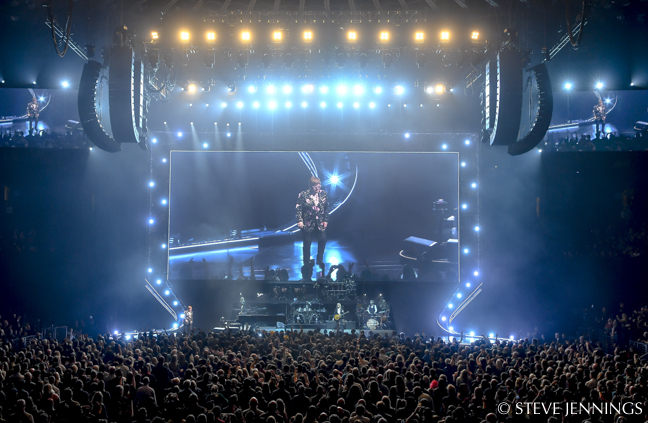 Tait worked with Stufish through the initial design developments as there were different options for the staging. 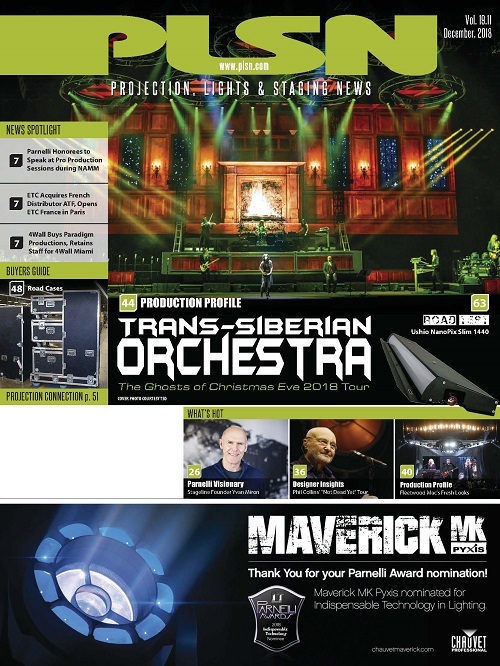 Jacqueline “Jacqui” Pyle developed 1:6 maquettes (scale models), which were sent to Tait. 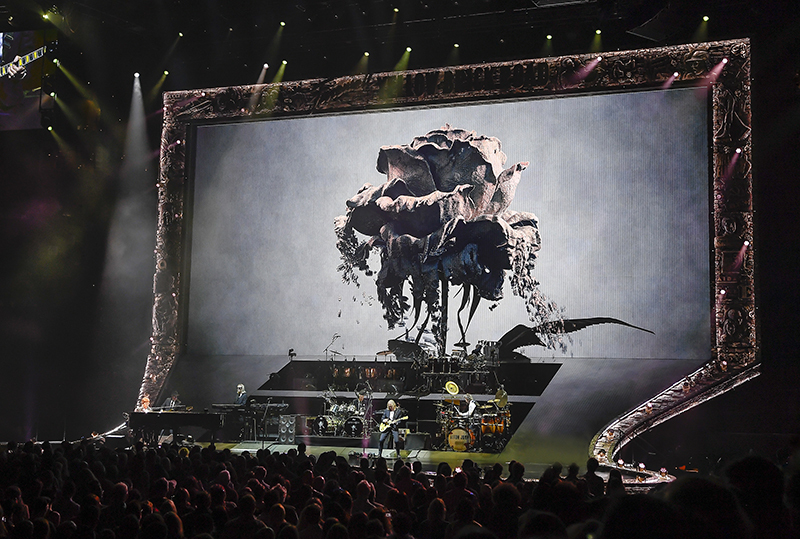 The Tait team of sculptors and painters built the full-scale artwork using her maquettes along with approved images to get all the details. 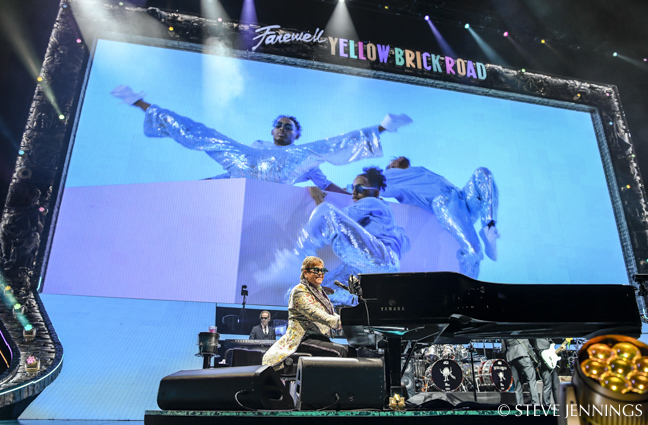 “The process of creating these started with a foam base, which were then built with clay for sculpting,” Nickerson says. 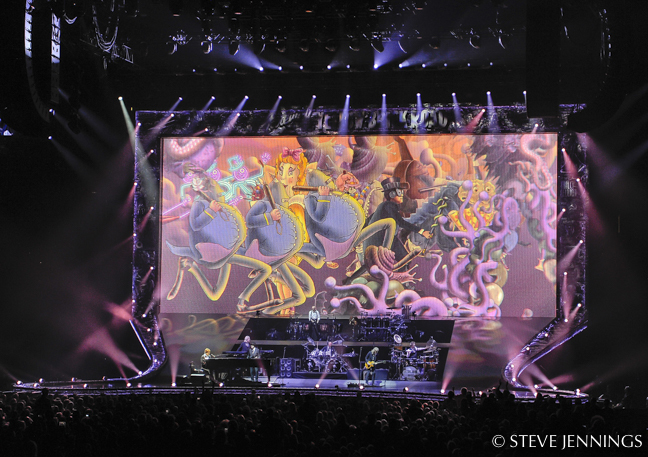 “We then made molds of the final art, the pieces range between 15 and 50 pounds. 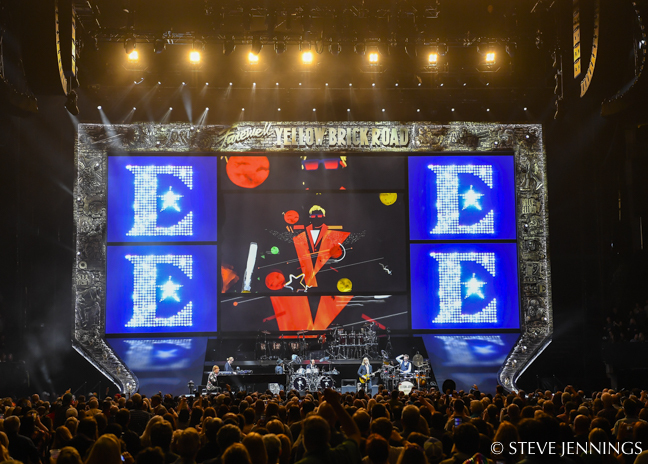 Once you add in the bricks and the structure, each six feet tall piece weighs about 450 pounds. 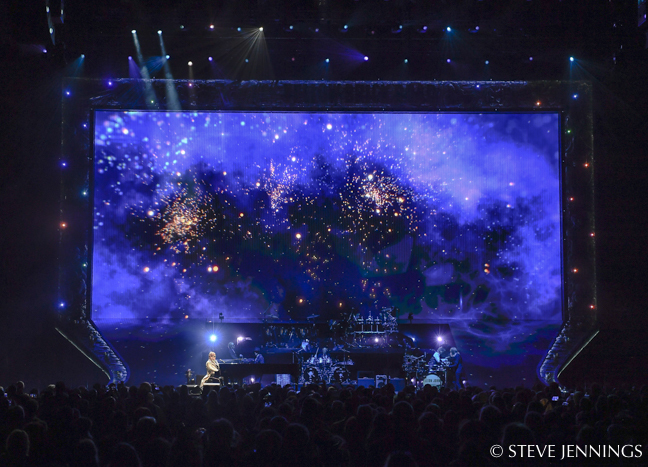 The main stage video screen is made up of two screens. 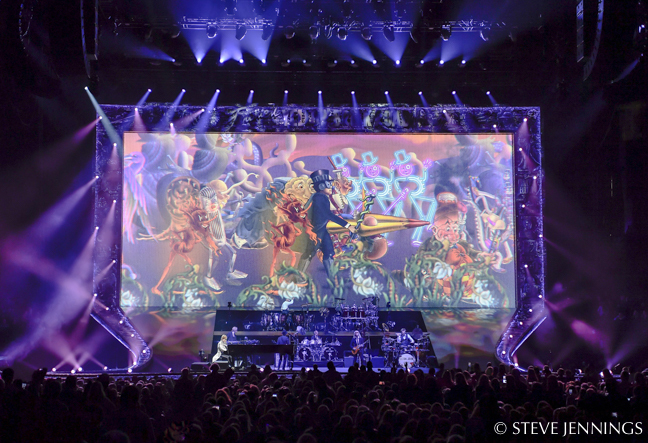 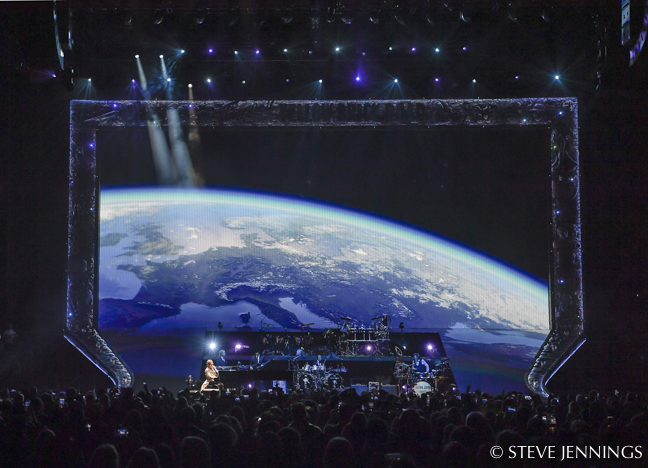 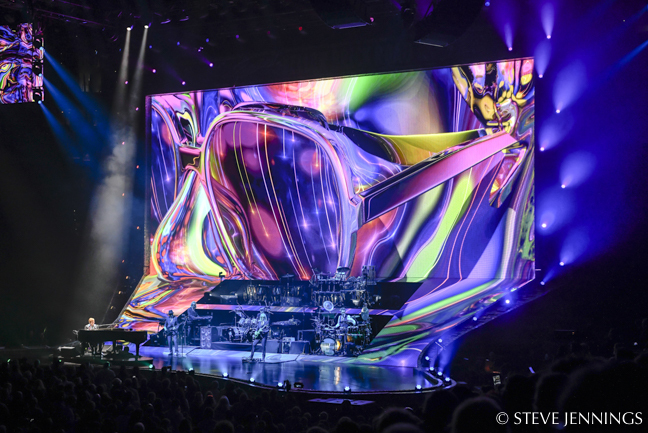 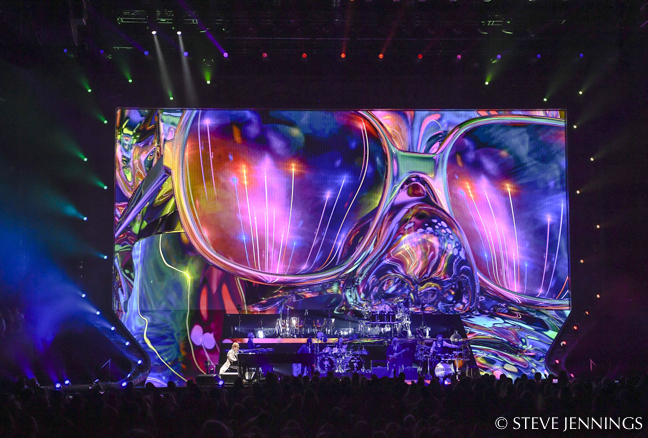 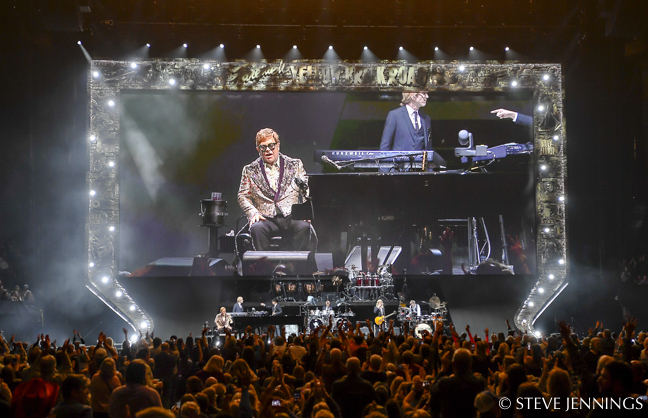 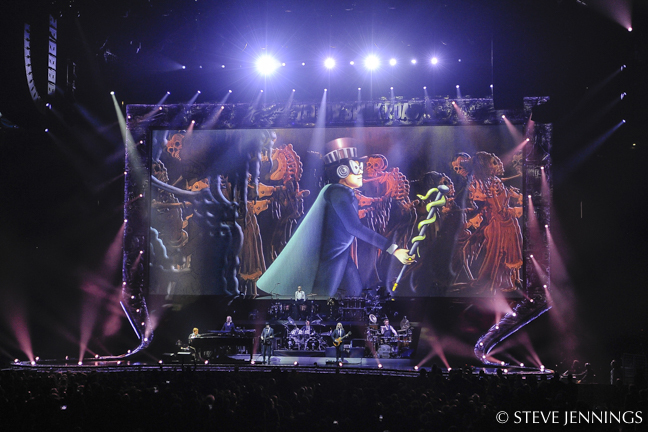 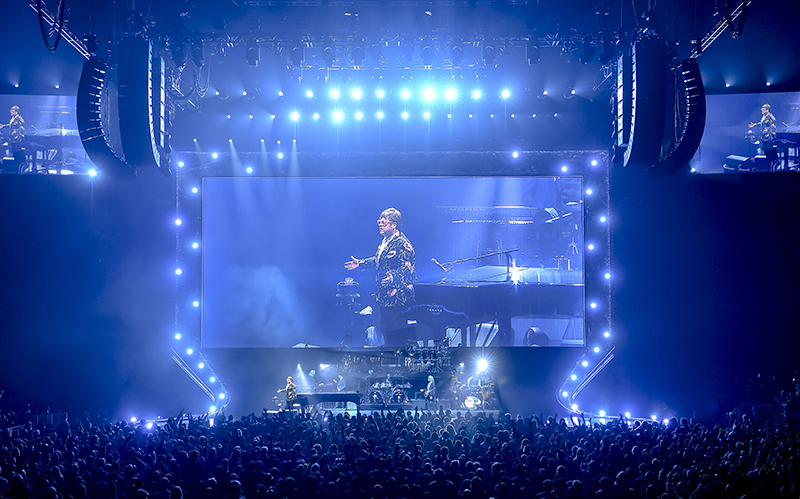 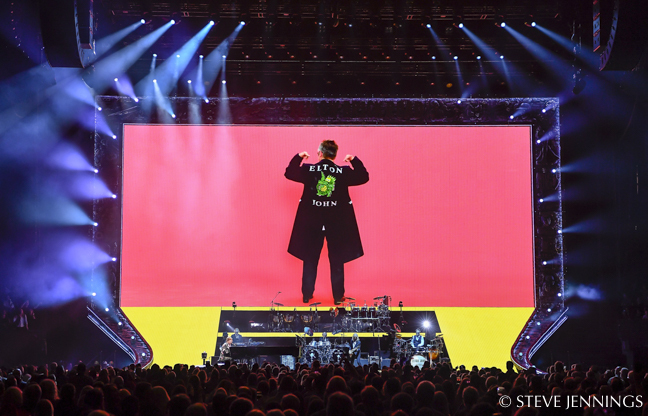 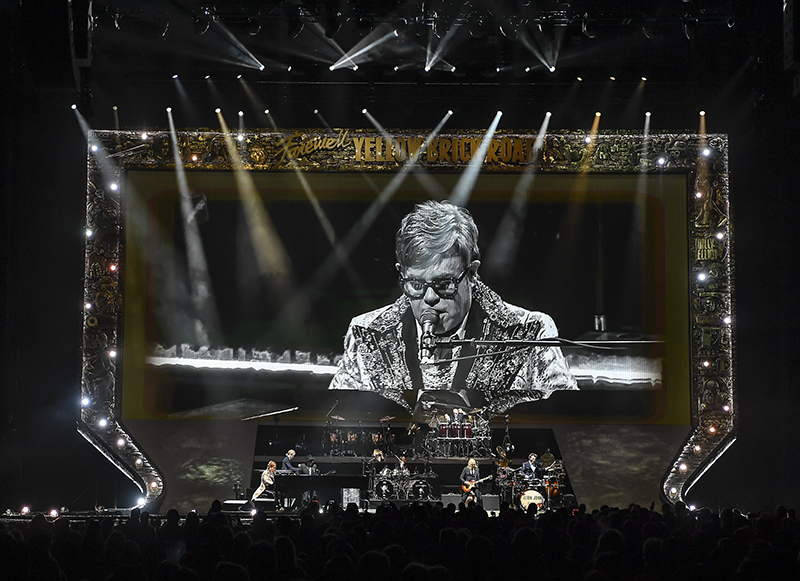 Below the main backdrop video screen is a video screen ramp made from Tait double-deckers with a built-in performance space for Elton John’s band. 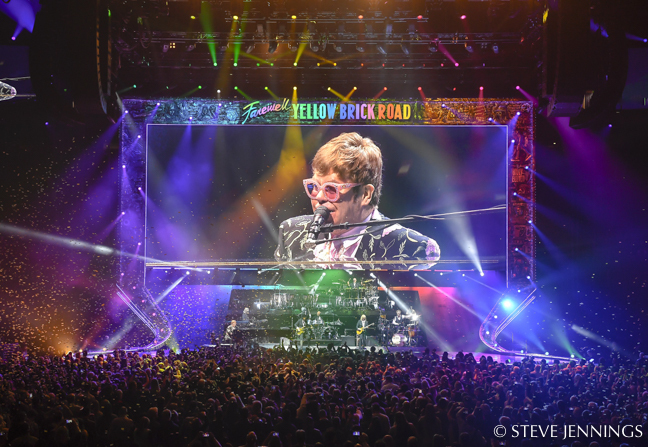 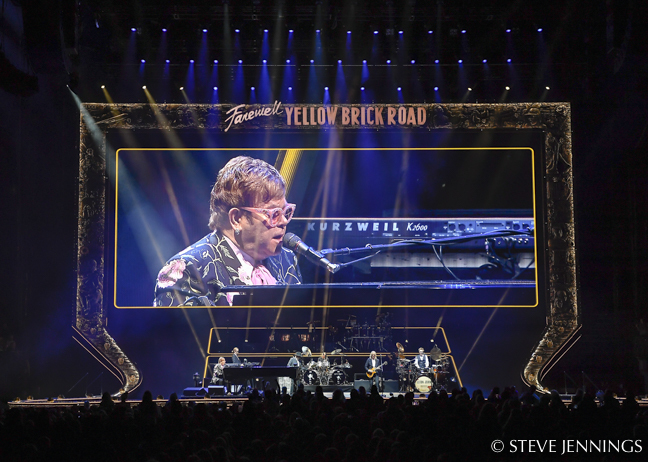 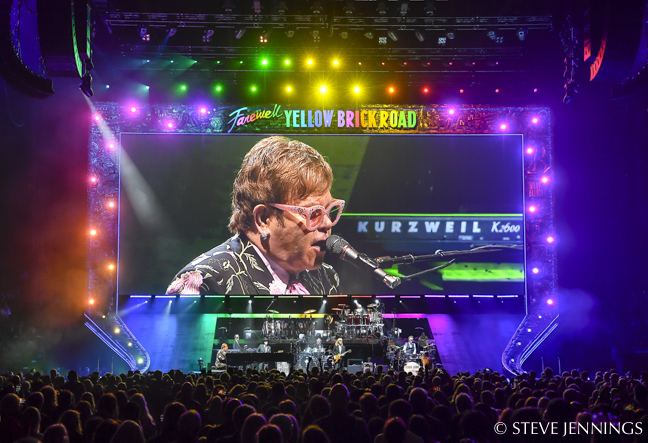 The LED video ramp is also furnished with a stage left performer lift used after Elton John’s last song, “Goodbye Yellow Brick Road.” Then comes the dramatic moment when the artist makes his grand farewell.